A 30-year-old woman is expected to appear at Elgin Sheriff Court today following an incident in Buckie. An IT analyst has been fined £1,000 after waking up in his car following a night out and deciding to drive to a supermarket to quench his thirst. Tesco has confirmed that up to 9,000 jobs are at risk across its head office and stores as part of efforts to “simplify” the business. A Moray couple forced out of their home after a Tesco lorry crashed into it eight months ago were unable to spend Christmas and New Year in their own house. A group of supermarket workers have admitted hatching a plan to steal cosmetics, alcohol and food from a north-east store. A popular department store in Moray will close its doors this month. 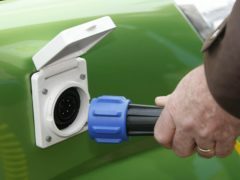 Free charging points for electric cars are to be rolled out at hundreds of Tesco stores from next year, the supermarket has announced. If you need a good laugh, just go to a supermarket at a busy time. Friday teatimes or Saturday lunchtimes, for example. Go in but don’t stray too far from the door. Then just hang around, looking all unconcerned and non-suspicious until you spot a target. Tesco has launched its discount brand Jack’s as it takes the fight to German budget supermarkets Aldi and Lidl. Supermarket bosses have been told stop “ripping off” motorists in the north and north-east amid growing anger at fuel price “disparities”. Motorists are being forced to pay extra for fuel at supermarket filling stations just a few miles apart amidst claims of “greedy profiteering” at the expense of rural buyers. A former military man built up a secret stash of photographs of a supermarket worker and tried to follow her home. A Buckie shopworker has been praised for stopping an elderly couple from being scammed out of hundreds of pounds. A woman was recovering last night after being knocked down by a car outside an Aberdeen supermarket. Motorists are facing lengthy tailbacks along a busy Aberdeen road following a crash near a supermarket this afternoon. A woman assaulted a shop security guard with a trolley after being challenged while trying to steal a vacuum cleaner. A Rothes couple forced out of their home after a Tesco lorry smashed into it will not be able to return for at least six months. The chief executives of Sainsbury’s and Asda have been summoned before MPs to answer questions on how the supermarkets’ proposed £12 billion merger will impact farmers, suppliers and consumers. Police are tonight investigating the theft of a car from outside an Aberdeen supermarket. Firefighters were called to a blaze which destroyed a shed and spread to nearby hedges in an Aberdeen garden earlier today.